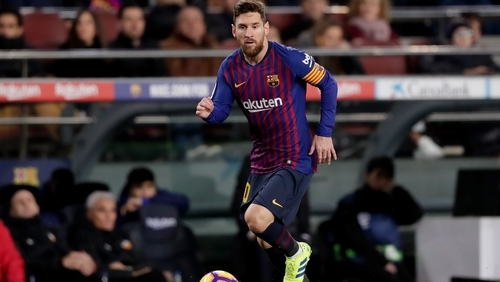 Messi has been battling a leg injury suffered in Saturday's La Liga win over Valencia - a game in which the 31-year-old scored his 12th goal in his last nine games. "I've not seen Messi today... so have no answer," Valverde told reporters ahead of Barcelona's Tuesday evening training session. "We have training now, we will see how he is. I'm not big on taking risks when there are a lot of games ahead of us. "If LaLiga ended tomorrow, if it was our last game... but if a player has an injury, whether it's Messi or not, I prefer to be careful." While the two sides will become even more familiar with one another in upcoming weeks, Madrid boss Santiago Solari does not believe the cup tie will impact on the league battle. "They're different competitions," he said. "We want to win everything and put the same focus and the same approach to the football as in the previous matches. "In football you have to look at the short, the medium and the long term, but the competition has its own rhythm and can cause unexpected things. "It's impossible to foresee everything. The important thing is that we are all together and we all pull in the same direction." Solari also insists he will not be contemplating whether or not his side will come up against Messi - and will have no special plans either way. "It's always good to play the best in every game," he added. "Whether or not he plays does not influence our preparation for the game".